To have a united footing before next round of climate talks in Qatar, the BASIC group — Brazil, South Africa, India and China — has decided to discuss their strategy before individual countries make their submissions for the Durban platform before end of February. The climate talks of 195 nations in Durban, South Africa, had decided to initiate Durban Platform to agree on a new climate treaty by 2015 to be ratified by individual nations by 2020. Each country is required to make submissions of what it wants in Durban Platform by February 28. As the new climate treaty aims to have binding emission cuts for emerging economies such as India and China, there were differences among the BASIC countries on the issue. 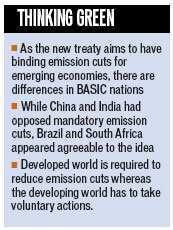 While China and India had opposed mandatory emission cuts, Brazil and South Africa appeared agreeable to the idea. “We have not agreed for any emission cuts,” environment minister Jayanthi Natarajan had told Parliament in December. Since the Durban meeting, there has been a realisation that agreeing to emission cuts will mean changing the basic principle of common but differentiated principle (CBDR) enshrined in the UN climate convention. Russia has already proposed an amendment in the convention to scrap the distinction between the rich and the developing world for taking climate mitigation actions, a CBDR proviso. Developed countries are required to reduce emission cuts whereas the developing world has to take voluntary actions. Another proposal of concern for BASIC group is of Mexico and Papua New Guinea to take decisions under the UN convention on basis of majority vote rather than by consensus of all countries. If agreed, it will become easier for rich nations to push their agenda as island nations and least developed nations have been backing them. Amid these concerns, environment ministers of the BASIC countries would be meeting in Delhi on February 14 to firm up a strategy to counter the move of the European Union and the United States to push for mandatory emission cuts and seek finance from them to fight climate change.